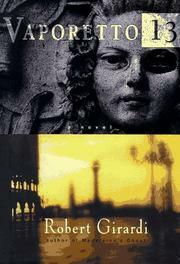  An American banker adrift in Venice takes up with an older woman--centuries older--whom he encounters while meandering through the city's labyrinth of back streets, in an erotically charged, dreamlike third novel from Girardi (Madeleine's Ghost, 1995; The Pirate's Daughter, 1997). Jack Squire, a foreign exchange trader in Washington, D.C., is handed a plum assignment: to study Italian politics in Venice so that his bank can make a killing on the lira after the upcoming national elections. But once he arrives, something about the city won't let him sleep, or do his job properly. In the wee hours one morning, after yet another night of insomnia, Jack meets Caterina, who's feeding a yowling horde of the famous Venetian alley cats, and he's stunned by her pale, ethereal beauty. In subsequent meetings, Caterina tells him nothing about herself, but eventually she takes him to meet some of her friends, who are every bit as mysterious as she. By day Jack bungles his reports to Washington; by night he and Caterina become lovers, so that his nocturnal adventures with her are soon all he really cares about. A disastrous business meeting with his boss in Milan seems to signal the end of his career, until he discovers that he can somehow read imminent death in the other man's eyes, leaving the boss so unnerved that he spares Jack the ax. Soon after, Caterina stops seeing him, but he manages to find the place where she feeds cats again and trail her on her way home, finally spotting her as she boards a vaporetto with all of her weird friends. Jack later reaches the vaporetto's destination--and has his worst fears about the love of his life confirmed. For as long as tale's dream state is sustained, the result is exquisite and eerie. But the last third, involving a retirement home in Arizona and a new career in Bar Harbor, Maine, ranges far from Venice--and breaks the spell.